Avalon Boomerang Bags celebrated its 1st birthday on June 25th 2017. This volunteer community initiative aims to reduce the number of single use shopping bags by providing recycled and handmade bags made from donated materials. and Bilgola Plateau. Whilst a huge success, the community is reminded the bags need to come back to the boxes so other residents may use them when they forget their shopping bags. Ergo the 'boomerang'! 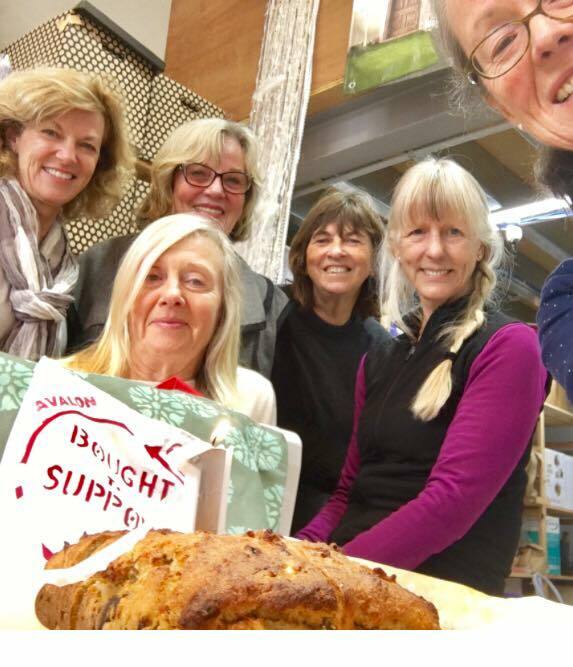 To continue providing alternatives to single use plastic bags, Boomerang Bags is looking for additional volunteers and donated materials. Tuesday workshops are conducted on premises in Mona Vale kindly provided by ‘Sew, Craft and Cook’ at 20/14 Polo St Mona Vale. Say ‘No’ to plastic bags this July. Say 'No' to takeaway coffee cups and say 'Not Likely' to prepackaged fruit and vegetables when shopping - let's turn that plastic tide. Avalon Boomerang Bags Celebratory morning tea! Mona Vale Bushcare and Pittwater Natural Heritage Association have been awarded a Stronger Communities Grant to continue the restoration of the coastal dune and littoral rainforest at the end of Basset Street. The Bushcare group will continue to remove weeds, replant native species and encourage natural regeneration. The $12,000 received will be used to support the group through contract bush regeneration and the purchase of native plants. This site has been chosen for Bushcare volunteers to come together and join in the nationwide “Bushcare’s Major Day Out” event to support all our local volunteers working to conserve and restore our unique natural environment. When: September 17, 2017 - 8.30 a.m.to 12p.m. A compliance operation conducted by the NSW Department of Primary Industries (DPI), from December 2016 to May 2017, has resulted in the seizure of over 1000 illegal crab traps and nets as well as 920 crabs. DPI Director of Fisheries Compliance, Patrick Tully said the operation codenamed ‘Portunus’ involved hundreds of patrols aimed at targeting illegal crabbing to apprehend offenders creating deterrence, coupled with an educational campaign designed to increase knowledge of crab fishing rules. “Fisheries Officers detected 440 recreational crabbing offences and 26 commercial crabbing offences,” Mr Tully said. “Fisheries Officers used high-tech equipment including long-range surveillance cameras and drones to locate illegal traps and illegal fishers and will continue to use innovative methods to improve compliance. “In one operation on the far north coast, NSW Police assisted Fisheries Officers in detecting a commercial fisher ‘rolling’ or ‘looting’ other commercial fishers’ traps. Most of the offenders have been issued penalty notices of up to $500 each while some will be issued court attendance notices and face fines of up to $22,000 or 6 months imprisonment, or both, for the first offence. These penalties double for second or subsequent offences. A total of 10 offences were detected in the retail sector, mostly in the greater Sydney and Central Coast areas. “Any seafood that is not handled, stored and prepared in the proper manner may pose serious health risks to consumers, therefore it is vitally important that people buy their fish and crabs from legitimate sources,” Mr Tully said. All fishers are reminded that if they are going crabbing to check the rules in the area by visiting the local fisheries office or dpi.nsw.gov.au/fishing. associated amendments to approved final landform design. Approximately 67 hectare (ha) extension of the Eastern Out of Pit Emplacement. Applications for grants up to $3 million are now open to councils, waste and/or organics processing companies and not-for-profit organisations who have plans for projects that can tackle the amount of food and garden waste that goes to landfill. Previous rounds of these grants have already funded projects that have made a positive impact on local communities. Last year 3 Pallaettes was awarded a $295,600 Organics Processing Infrastructure Grant to provide the Central Coast with an open windrow composting system for organic wastes, that would otherwise be sent to landfill, to produce a premium grade humified soil conditioner. With a $89,500 grant under the Food Donation stream, Settlement Services were able to purchase a van, cool rooms and freezer to run The Staples Bag program, supplying a bag of food staples to people in need. EPA Unit Head Organics Amanda Kane said the grants gave councils and community groups the chance to fund projects that could make a real difference when it came to organic waste. “From saving good food from being wasted and tackling food insecurity in our state, to increasing NSW capacity to process more collected green waste, these grants are designed to tackle organic food waste from every angle,” Ms Kane said. The Office of Environment & Heritage (OEH) Director Grants Peter Dixon said the Environmental Trust was pleased to offer the new rounds of organics funding for organics collections under the Waste Less, Recycle More initiative. The grants are being delivered through a partnership between the EPA and the Environmental Trust (which is administered by OEH). A spectacular days whale watching with great friends, spotting 99 Humpbacks from Bilgola Headland. A huge well done to everyone who took part & made this years ORRCA National Whale Census Day such a success. The web-based reporting tool identifies and ranks vessels across the globe based on a list of behaviours associated with illegal, unregulated and unreported (IUU) fishing. CSIRO senior scientist and co-designer of the platform Dr Chris Wilcox said the tool used data collected by satellites to monitor and report suspiciously behaving vessels. "Almost all vessels are equipped with anti-collision devices that can be detected by satellites," Dr Wilcox said. "Using data from these systems, we can shine a spotlight on vessels acting suspiciously based on factors including the vessel's history, movement and whether its transmitter has been intentionally disabled. "Countries will be able to sign-up to receive notifications, or directly access the portal to search for vessels and then be provided with a report which highlights the suspicious behaviours involved." The announcement follows the execution of the first international treaty aimed at eradicating IUU fishing, coordinated by the United National Food and Agriculture Organisation and agreed to by 29 countries. "As well as costing tens of billions of dollars each year, IUU fishing leads to overfishing and depletion of stocks which has the greatest impact on developing countries whose people rely on fish as their primary source of protein and income," Dr Wilcox said. "As global population numbers continue to grow, combatting IUU fishing is becoming even more important to ensure future food security for the world." The CSIRO team led by Dr Wilcox has also been working closely with the Indonesian government to address the problem. The project is part of a collaboration with Microsoft co-founder Paul G. Allen and his U.S.-based company, Vulcan Inc.
"This valuable tool will enable enforcement agencies to identify and locate suspicious vessels all over the world," said Dr Mark Powell, illegal fishing program officer for Vulcan. "Countries that use this new tool will now be able to reverse the tide of illegal fishing and help rebuild depleted fish stocks." The platform will be officially launched in October and is already anticipated by a number of national and international surveillance agencies, including the UN Food and Agriculture Organization, United States National Oceanic and Atmospheric Administration and the Leonardo DiCaprio Foundation funded Global Fishing Watch. Illegal fishing is the third most lucrative crime in the world, after weapons trafficking and drug smuggling. It's estimated there are 26M tons of illegal fish caught each year, worth approximately US $23 billion. It happens in all parts of the world but is particularly problematic in the developing world where low capacity and funding make it difficult to fight. 1/3 of fish in US markets appears to be illegal. Approximately 25 per cent of Australian fish is thought to be mislabeled both in species and source. 120 million people globally depend on fishing for their income. Tokyo, Japan - The Government of Japan today passed the “Bill On the Implementation of Cetacean Scientific Research for the Resumption of Commercial Whaling” (translation by IKAN), despite opposition by environmental groups from Japan and the international community, and with virtually no debate within the Diet (parliament). Toughen immigration controls on foreign activists and shun global opinion. There are two primary problems with the bill. The second is that Japan’s scientific basis for its whaling program is seriously questioned internationally. ‘Scientific research’ at first may sound like a good contribution to international knowledge, but the research program is based on lethal catches of whales. It has been 70 years since the International Convention for the Regulation of Whaling concluded. Meanwhile, the environment for whaling operations has changed, and non-lethal research technologies have advanced. More than 20 resolutions asking Japan to cease or reevaluate Japan’s research whaling have been adopted at the International Whaling Commission (IWC). Furthermore, the International Court of Justice ruled in 2014 that Japan’s research whaling operation in Antarctica failed to show that it was for the purpose of scientific research, and concluded that it violated the international agreement. In response, Japan resubmitted its draft plans for research whaling operations in Antarctica and in the Northwestern Pacific Ocean, but these have also been severely criticised by the IWC Scientific Committee Experts Panel. The bill ignores the current controversies surrounding the operations, attempts to shut out criticism, and is designed only to continue research whaling no matter what the cost - to either the whales, Japan’s international reputation, or to the Japanese taxpayer. Consequently, with the bill’s passage, our tax money will be spent on these wasteful programs every year, whilst damaging our relationships with otherwise friendly nations, and disgracing ourselves internationally. The Fisheries Agency currently appropriates 5 billion yen annually for the research whaling budget. This amount exceeds the 4.6 billion yen that is allocated for resource assessment for Japan’s entire coastal fisheries. Now even more public funds will be invested, and not only the development of the fisheries industry but also all other fisheries operations will suffer. It has no connection to Japan’s national interests, and we therefore will continue to oppose this legislation. 1. Moratorium on commercial whaling adopted in 1982 – requires ¾ votes to overturn the rule. In late March 2017 Japan's whaling fleet returned from the Southern Ocean for another year with its catch of 333 minke whales on board. Japan was able to conduct the 2017 'whaling program' under a loophole in the International Whaling Commission (IWC) rules, which allows for scientific whaling. From now on that loophole will tighten a little: Japan will have to submit its proposed catch to a scientific working group within the IWC. The commission will ask for further justification about why the scientific program needs to kill the whales to study them. The Fisheries Ministry said its research was focused on the reproductive and nutritional cycles of minke whales. "The purpose of this research is to carry out a detailed calculation of the catch limit of minke whales and study the structure and dynamics of the ecological system in the Antarctic Ocean," it said. In 2014, in a case brought by Australia, the International Court of Justice found that permits issued by Japan were "not for purposes of scientific research" and instructed the country to halt its JARPA II program. Japan called off its 2014 hunting season, but submitted a new document to the IWC in the lead-up to the 2015-2016 whale hunt. The document, titled NEWREP-A (New Scientific Whale Research Program in the Antarctic Ocean), set out its planned catch of 4,000 minke whales over 12 years — which is where the 333 quota per year comes from. In January 2017 Sea Shepherd stated it had caught Japanese whalers in Australian waters with a slaughtered whale on board. The group released pictures showing a dead protected minke whale on board the Japanese whaling ship Nisshin Maru, allegedly in Australian waters. A Sea Shepherd helicopter spotted the vessel with two harpoon ships nearby. "They're (the minke whales) hit with an explosive harpoon that goes straight into their body, hooks come out and shrapnel is sent through their body, it's a terrible bloody death… these whales can take up to 30 or 40 minutes to die," Jeff Hansen from Sea Shepherd said. Sea Shepherd stated the Japanese crew quickly covered the whale with a tarpaulin. "A soon as the whaling fleet saw that Sea Shepherd on the scene, they were scrambling to cover up their illegal operations, they were covering up their harpoons," Mr Hansen said. At the time the Japanese Prime Minister, Shinzo Abe, was on Australian soil. In 2015 Australia's Federal Court fined Japanese whalers Kyodo $1 million for hunting whales within an Australian sanctuary. The fine has not been paid. The Turnbull Government has welcomed a UNESCO decision to recognise Western Australia's expanded Fitzgerald Biosphere Reserve as part of the World Biosphere Network. Originally 330,000 hectares, the reserve - surrounding the Fitzgerald River National Park - now covers over 1.5 million hectares in the south-west of the state. Recognised for its relatively pristine state and high biological diversity, the Fitzgerald Biosphere Reserve includes over 40 species or communities recognised in WA as threatened. More than 30 of these are also listed by the Commonwealth. The area's forests, river basins, small mountain ranges, wetlands and estuaries are formally recognised under the Man and the Biosphere Programme. Biospheres balance three important goals: conservation of biodiversity, promotion of economic development and maintenance of cultural values. They allow sustainable development based on local community efforts and sound science. First recognised in 1978, this expansion of the Fitzgerald Biosphere Reserve is testament to the success of a community-driven approach to integrated landscape management. There is strong community support in the region for the biosphere and its innovate approaches to living and working in harmony with nature. The Fitzgerald Biosphere Group (FBG) is a non-profit community organisation that works with farmers, researchers, industry groups and federal and state agencies to address local production (e.g. diseases, pests and nutrient limitations) and natural resource management issues (e.g. salinity and soil acidification) to ensure the long-term sustainability of the agricultural industry and the communities within the region. The FBG boasts an active membership, an energetic Management Committee and a team of dedicated staff. To identify and service the needs of our members and the wider Fitzgerald Biosphere community. To develop, maintain and enhance our relationships with agencies, other community groups and private industry. Jerramungup is situated in the western section of the Fitzgerald Biosphere Reserve and covers an area of 654 000 hectares, of which 263 000 hectares is conservation estate and crown land. The variation in climate, soil types, land capabilities and other environmental factors from north to south and east to west is very high, consequently there is wide range of farming systems in operation throughout the area. The main broad-acre agricultural products from the region are wheat, barley, canola, sheep for wool and meat production and beef cattle. The FBG operates in the western section of the Fitzgerald Biosphere Reserve which is locally, nationally and internationally recognised for its high biodiversity values. The FBG are working with the community to capitalise on the opportunities that this presents. Biosphere reserves are areas of terrestrial and coastal ecosystems promoting solutions to reconcile the conservation of biodiversity with its sustainable use. Biosphere reserves serve in some ways as 'living laboratories' for researching and demonstrating the integrated management of land, water and biodiversity in recognition of human interaction and community and economic development. The Fitzgerald Biosphere Reserve (listed as a Biosphere Reserve in 1978 under the UNESCO Man and the Biosphere Program) contains an undisturbed core enclosed by the Fitzgerald River National Park surrounded by additional areas of significant remnant vegetation. Beyond this buffer is the zone of cooperation', within which the regions agricultural production takes place. The Fitzgerald Biosphere Reserve is referred to as "the most important Mediterranean ecosystem reserve in the world" (Dr Bernd von Drost, 1989) not only for its rich biodiversity, but for the way the community interacts with the environment and how they are all working to ensure long term sustainability. Jerramungup Land Conservation District Committee. The group has brought production and NRM together into a single pathway forward. They have consolidated their progress through a combination of strong strategic skills and effective community action. The FBG and its 'parent' organisations have been recognised on a number of fronts for their successes in project management, awareness raising, innovation and their ability to attract and maintain mutually beneficial partnerships and community support. The group maintains an excellent track record of locally driven action that has been developed over 20 years, which gives the community a sense of ownership and trust. Under our 20 Million Trees Program, the Turnbull Government will invest $70 million to plant 20 million trees by 2020. Community groups, organisations or individuals can now apply for grants between $20,000 and $100,000 for tree planting projects that will put back threatened bushland and support threatened species. Priority will be given to projects that target nationally-listed Threatened Ecological Communities. Under previous 20 Million Trees funding rounds, Landcare groups and community projects across Australia have planted three million trees. With 13.4 million trees already contracted for planting, today’s announcement will ensure that the 20 million trees election commitment target is met. The 20 Million Trees Grant Guidelines: Round Three are also now available and applications close on 15 August 2017. The 20 Million Trees initiative is an important part of the Turnbull Government’s National Landcare Program. More information is available at www.nrm.gov.au/20-million-trees. There is no limit to the number of applications applicants can submit. Each application will be for a single 20 Million Trees Project. Refer to Part 3 of the Guidelines for the eligibility and funding conditions for Applicants, Projects and Activities. 30 June 2020, for Projects seeking grant funding of $60,010 to $100,000 (GST exclusive). Note: Projects will not be able to undertake any planting activities in the final six months of the project period with the exception of planting to make good on any losses. This is necessary for plantings to be sufficiently advanced to allow an accurate final survey to determine the number of trees established at the end of the Project period. From 1 July 2017, the Biosecurity Act 2015 and its subordinate legislation will commence. An Act to provide modern, flexible tools and powers that allow effective, risk-based management of biosecurity in NSW. It will increase efficiency and decrease regulation in responding to biosecurity risks and provides a streamlined statutory framework to protect the NSW economy, environment and community from the negative impact of pests, diseases and weeds. NSW WeedWise is a mobile phone app that provides key information to reduce the impact of weeds in New South Wales. The app profiles over 300 noxious and environmental weeds, describing their legal requirements in NSW under the Noxious Weeds Act 1993, control information and registered herbicide options. Users range from home gardeners and residents to farmers, land managers and weeds professionals. Users can search or browse weed names (common or scientific); recognise a weed by its physical description and image gallery; find out about its impacts, where it occurs, how it spreads; and its preferred habitat. NSW WeedWise and it's supporting Weeds Information Database were developed at the Grafton Primary Industries Institute, with the assistance of the NSW Weeds Action Program. As the NSW Government Clean Air Summit gets underway in Sydney today, Lock The Gate Alliance has called for urgent action to bring down dangerous air pollution from the coal mining industry, which is the biggest single source of air pollution in NSW. Particulate pollution causes hundreds of deaths in New South Wales every year. Hunter regional coordinator for Lock the Gate Alliance, Steve Phillips said, “The NSW Government needs to act urgently to reduce the burden of pollution being inflicted on the people of New South Wales by the coal mining industry”. According to the EPA’s own discussion paper, coal mines are the biggest cause of large and small particle pollution in NSW, as well being responsible for significant amounts of of air-borne toxins such as arsenic and volatile organic compounds. The Clean Air Summit in Sydney today follows a discussion paper released by the EPA late last year which proposed that the state’s “load-based licencing scheme”, which is designed to reduce pollution by making polluters pay, should be extended to include coal mining. “There’s no excuse for leaving coal mining out of the load-based licencing scheme when other industries pay their fair share” Mr Philips said. “The EPA got over 1,500 submissions on this issue from the public, and reported strong support for applying the scheme to coal mining and making that industry pay for the cost of its pollution on the community. “The facts are on the table. Coal mines are the biggest emitters of particle pollution and particle pollution causes sickness and death. We have a scheme to reduce this pollution, we just need to apply it to the coal mining industry. “We call on the Environment Minister, Gabrielle Upton, to tell today’s summit that this simple step will be taken and to ensure that the free ride the coal mining industry has so far enjoyed at the public’s expense will be coming to an end,” said Phillips. Lock the Gate Alliance has accused the Federal Government of blackmailing state governments to force them to accept fracking, after Treasurer Scott Morrison threatened to cut GST to states unless they accept gas exploration. “This is an outrageous move by the Federal Government to blackmail state and territory governments into accepting fracking, regardless of the devastating impact it will have on farmland and water resources,” said Georgina Woods from Lock the Gate Alliance. “The Turnbull Government is effectively threatening to short-change schools and hospitals in their fervour to give gas fracking giants access to every last square inch of Australia. “We will be asking for urgent advice as to whether it is lawful for the government to subvert the proper return of tax dollars to states in order to pursue a blatantly political agenda to promote multinational fracking companies. “This is yet another example of the fracking industry undermining our democratic institutions – even the fair distribution of GST dollars is now being hopelessly compromised by the debasement of our democracy to fossil fuel interests. “These actions will only make communities across Australia more determined to stand together and defend our land and water against an industry which has no social licence to operate. “Australians well know that the future is in renewable energy and battery storage, and a strong, value-added agricultural sector, not dangerous and unnecessary fracking,” she said. Tasmania, Victoria and the Northern Territory have fracking bans or moratoriums in place. New South Wales has allowed fracking - most notably the extremely unpopular support the state government has given to the Pilliga Santos project, where surveys for a gas pipeline through the private land and food producing paddocks of farmers was going ahead last week - June 22nd The Land, despite overwhelming opposition by the residents within the areas this will effect. South Australia and Queensland are the only two states currently without a limit on fracking or other gas exploration. The comments were made by the Federal Treasurer while in Darwin onWednesday, June 28th. A new era for commercial fishing is one-step closer following the successful completion of the NSW Government’s subsidised Share Trading Market. Minister for Primary Industries, Niall Blair said the results show most active commercial fishers were able to buy the shares they needed in the market. “There was more than $15 million spent to subsidise shares and buyout fishing businesses. In the market, we spent on average $4 for every $1 spent by fishers. “Most importantly, unused (or ‘latent’) shares have now moved into the hands of fishers who will use them to provide more fresh, locally grown seafood for NSW consumers. “95% of fishers, who want to keep fishing, now have the minimum shares they need. We will be case managing the remainder to ensure those active fishers have every chance of staying in the industry. “The sector will continue to adjust until 1 December 2017 when the new share linkage arrangements switch on, and there will be an active market after that. Throughout these reforms, the NSW Government has supported industry with a range of assistance measures including grants for business, legal and financial advice and by establishing an independent advisory council CommFish NSW. Chair of CommFish NSW, Stuart Richey AM said things are moving in the right direction for NSW, with the redevelopment of the Sydney Fish Markets and now a positive outcome from the industry adjustment. The market showed there were plenty of shares available in most share classes and that the Government subsidy has been enough to shift a significant number of those shares. A recent project undertaken by Walcha Area National Parks and Wildlife Service staff installing artificial hollows or nest boxes has had immediate results with both sugar gliders and brush-tail possums moving in within 6 months. NPWS Ranger Sam Doak said the project provided homes for arboreal mammals, which then supplemented the food source for threatened owl species. "A tree without a hollow is like a house without a door for species such as sugar gliders that depend on making their home inside the trunk. "This project centred on new land recently added to the Oxley Wild Rivers National Park east of Walcha, where there were areas of regrowth where hollows had not yet formed. "By providing supplementary nest boxes, we were able to encourage the arboreal and ground dwelling fauna to expand their range into regrowth areas. "This means more homes for possums and sugar gliders. "A secondary benefit is the additional food source then available for threatened powerful owls and other birds of prey. "The powerful owl is Australia's largest owl, requiring very large hollows and plenty of food for its young and is found in Oxley Wild Rivers National Park. "An important part of the nesting box project was monitoring the boxes to determine if they were being used. "The boxes were monitored from the ground, using a remote digital camera, wi-fi, a mobile phone app and a 6 metre extension pole, which minimised the need for disturbance and the use of ropes and ladders. "The monitoring detected possums and sugar gliders using the nesting boxes and also photographed powerful owls utilising the food source. "After just six months in operation, this was a great result and indicates the nesting boxes are an important tool in assisting to accelerate natural processes," Mr Doak said. Fishers discard a portion of their catch because fishing practices damage the fish and make them unmarketable, the fish are too small, the species is out of season, only part of the fish needs to be harvested -- as with the Alaska pollock roe -- or the fishers caught species that they were not targeting, something known as bycatch. The National Parks and Wildlife Service (NPWS) is calling for comment on the draft plan of management for Mallee Cliffs National Park near Mildura. NPWS Director Mark Peacock said the draft plan is on exhibition until 28 August and outlines the park’s values and proposed management. “Plans of management are legal documents that enable us to have a clear understanding of the values of the park and how we will manage them into the future,” said Mr Peacock. “Mallee Cliffs National Park is nestled in the south-west corner of New South Wales on Barkandji Country and is an important area for wildlife conservation. “As a part of the NSW Government’s flagship Saving our Species program, the plan includes the Reintroduction of Locally Extinct Mammals project to be developed on the park by the Australian Wildlife Conservancy. “This ambitious project aims to reintroduce at least ten mammal species that have been extinct in the Mallee Cliffs for more than a century including the bilby, numbat and brush-tailed bettong. “Mallee Cliffs National Park protects extensive areas of flat to undulating sandy red plains and linear sand dunes formed during arid periods from 350,000 to 500,000 years ago. 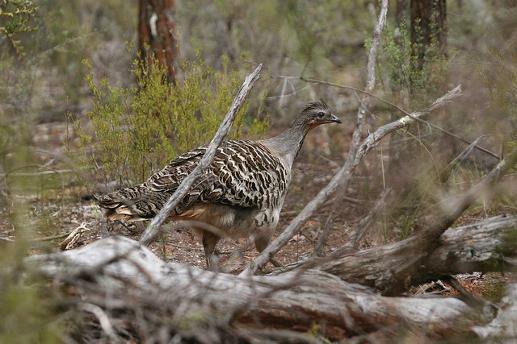 “The park is also home to 27 threatened animal species, including the endangered Malleefowl and Western Pygmy Possum,” Mr Peacock said. Submissions on the plan must be received by 28 August 2017. A grand old lady of the high country has had a spruce up to coincide with her 91st birthday, but this nonagenarian won’t be blowing out her own candles. Tin Hut was built in preparation for the first winter crossing of the Snowy Mountains and, some 90 years on, she’s just enjoyed a face lift. 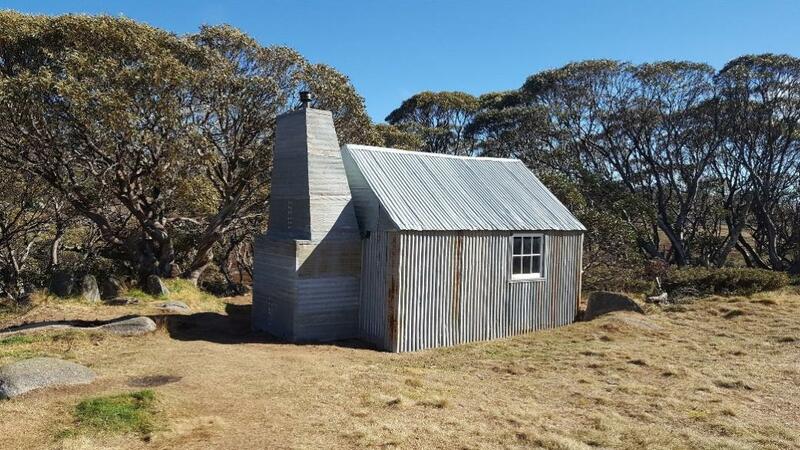 National Parks and Wildlife Service (NPWS) Area Manager Anthony Evans said the works to upgrade Tin Hut, coincided with the 90th anniversary of the first successful winter crossing of the Snowy Mountains from Kiandra to Kosciusko. 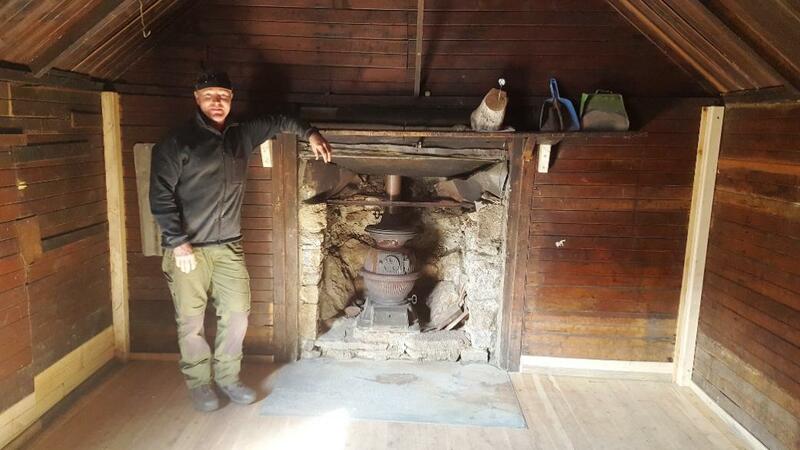 “Tin Hut is one of several historic huts across the High Country that today provide emergency accommodation for ski tourers and bush walkers as well as a window to the past,” Mr Evans said. “When it was completed in 1926, Tin Hut was a crucial part of an attempt to cross the Snowy Mountains in winter, a feat that had never achieved. “The Hut was built specifically for the winter crossing attempt, where it proved to be a life saver. “The crossing in 1926 was thwarted by bad weather which saw the party, led by ski pioneer Dr Herbert Schlink, holed up in Tin Hut for several days before returning to Kosciuszko without completing the crossing. “A second attempt in July 1927 was successful with high country huts including Tin Hut providing refuge along the route. “Ninety years may have passed but Tin Hut is still in a remote location, making the renovation works challenging, although we did have access to some modern conveniences, including a helicopter, to do the heavy lifting,” Mr Evans said. Decades of exposure to the harsh elements of the High Country saw the wooden corner posts rotted at ground level. NPWS staff along with members of the Kosciuszko Hut Association, spent weeks virtually dismantling and reassembling the hut replacing the frame and reattaching the original cladding. “This painstaking work, which involved camping out on site, means none of the historic aesthetic has been lost - the hut looks and feels the same as it did previously. “The result is an old hut with a new frame which should see it through many more decades and a reminder of the pioneering spirit that opened up the Snowy Mountains,” Mr Evans said. Tin Hut in Kosciuszko National Park receives a new frame in time to mark the 90th birthday of the first winter crossing of the Snowy Mountains. Short of food, fire and bedclothes, a party consisting of Drs. Herbert Schlink, Lennox Teece, and Eric Fisher, and Messrs. Richard Allen, William Gordon and Arnold Moulden, was in close grip with a blizzard which kept them prisoners in a small hut at Kosciusko for three days last week. The party returned to Sydney today — all well. Led by Dr. Schlink noted alpine skier and climber, the party left Bett's Camp after a heavy snowstorm at Kosciusko on Saturday afternoon with the object of traversing the 75 miles journey to Kiandra within three days. In good weather the first stage of the trip to Bett's Camp was accomplished, but not without Incident, as Dr. Teece, borne on the back of Mr. Gordon, nearly came to grief in fording the Snowy River. Having slept at. Bolt's Camp on the Saturday night, the party the next morning explored the whole of the range, and had got to Gungarton Pass, when a snow storm burst. Visibility was very bad, and it became a grim fight, not only to reach the sheltering hut, but to find It. Luckily, despite the fog and mist, the Tin Hut was eventually reached, this being the furthest place on the main road to be reached in winter. Hardly had the climbers settled themselves down in the Tin Hut when the blizzard burst in great fury. They had provided themselves with three days' rations, and in the hut were a tin of bully beef, a bag of flour and a tin of baking powder. Cramped for space, and with only one blanket to each man, and with the sodden wood throwing off more smoke than heat, the party suffered intensely from the cold. As the days sped by, and the raging blizzard, blizzard prevented escape, their plight became critical. Food ran out, and one of the party turned his hand to bread-making, but the stuff was like leather and uneatable. Another attempt by Mr. Gordon was more successful, and the captives munched ravenously at the hard bread. Photo: The tin hut in which six men spent three days. From Sunday afternoon until Wednesday morning the climbers were weather-bound in the hut, and time had hung heavily, on their hands. Occasional rushes were made outside In search of wood, while attention was given to improving the hut. At 10.30 a.m. on Wednesday, with all food exhausted, the party determined on the daring hazard of defying the blizzard, which had abated a little. They decided to strike across country to the hotel over the Snowy River. Progress was slow in the teeth of the gale though only ten miles had to be negotiated. In face of many hardships, the party, plodded on, missing by Inches menacing crevasses, and almost borne down by hall and wind. With their clothing held over their heads, the climbers they forded the Icy waters of the Snowy. On the other side It took them nearly an hour to restore circulation. The end of their goal came at last, the Hotel Kosciusko being reached at 5.30 p.m. on Wednesday. It was an almost unbeaten track the party took, over hairpin bends and along steep gorges. Great anxiety prevailed at Kiandra when the climbers failed to reach the town, and search parties were being organised when word came through that they were all safe. Dr. Schlink not only knows the perils of Kosciusko — he has climbed the principal peaks in Europe. Messrs. Leslie Conselt Stephen and Alastair Stephen were almost in the adventure. They accompanied the main party as far as Gill's Knob, 10 miles out, but returned from there to the hotel. Dr. Schlink, after his first foray into Australian snow from at least 1909, and earlier, as mentioned above, during the white fields that can overcome a Goulburn Winter, was a member of the Ski Club of Great Britain (1910-62) and an honorary member of the Kandahar Ski Club (Gold K) from 1928. In 1960 the Schlink Pass between Guthega and Geehi was named after him. Short of food, fire, and bed clothes, a party consisting of Drs. Herbert, Lennox, Schlinck, Teece and Fisher, and Messrs. Richard Allen, William. Gordon, and F. Moulder, were kept prisoners in a small hut at Kosciusko by a blizzard for three days last week. The party returned to Sydney to-day, all well Led by Dr. Schlinck, a noted Alpine climber, the party left the hotel, Kosciusko on Saturday week with the object of travelling 65 miles to Kiandra within three day. In good weather the first stage of the trip was accomplished,- but not without incident, as Dr. Teece carried on the back of Gordon, nearly came to grief in fording the Snowy River. BIBY TV is delighted to present this rare footage of critically endangered Regent Honeyeaters (Anthochaera phrygia) in the wild. Around the middle of the twentieth century these birds were abundant across south-eastern Australia in a range that spanned from Adelaide to Brisbane. They were even seen in flocks or congregations of 100 or more. But by the 1990s it was clear that their numbers and range had declined dramatically. Today there are almost certainly fewer than 500 left (the Recovery Plan for the species estimates 350-400 adult birds). When they are seen in little pockets of suitable habitat it is usually a single bird or sometimes a pair. A flock of a dozen or so as in the last frames of the video (at least three birds were off-screen) is unfortunately a very rare sight nowadays (there were about 20 birds present the day we filmed these birds, so about 5% of the entire population!). Regent Honeyeaters are nomadic and follow the flowering of certain eucalypt species. BirdLife Australia and other research bodies monitor their movements as much as possible, including sightings by bird enthusiasts and the public generally. On the invitation of BirdLife Australia we visited the Cessnock area, NSW in June 2017. The actual filming site was on a private property in the Lower Hunter Valley Key Biodiversity Area (KBA), listed under this international conservation program due to the area’s importance to Regent Honeyeaters (and Swift Parrots). The habitat on the property we visited is protected under an in-perpetuity conservation agreement, brokered by BirdLife Australia and the Nature Conservation Trust and the landholder a few years ago. In this KBA the tree species that is the most important foraging resource for Regent Honeyeaters is Spotted Gum (Corymbia maculata). While we were lucky to visit the site on a clear morning, there was some concern that recent heavy rain might have damaged the blossoms. Thankfully we found several tall Spotted Gums with sufficient nectar for Regents and other honeyeaters (e.g. Noisy Friarbirds, Yellow-faced Honeyeaters, Fuscous Honeyeaters, White-naped Honeyeaters and Yellow-tufted Honeyeaters) as well as Little Lorikeets. Spotted Gum is also an important resource for the critically endangered Swift Parrot, which is often found on this same property, but we did not see or hear any on this visit (up to 200 of them had been found by BirdLife Australia staff in recent weeks in the Cessnock area). You can see and hear Swift Parrots on a property not far from where the Regent Honeyeaters were (filmed by BirdLife Australia staff in May 2017) https://youtu.be/-VMGoiwkq6U. The Swift Parrot are in the area due to good flowering of Spotted Gum trees and numerous birds were observed feeding on the blossom spread across the entire (large) property. Other bird species seen or heard in the area included the Bell Miner, Grey Fantail, White-throated Treecreeper, Superb Fairywren, Fan-tailed Cuckoo, Rose Robin, Grey Shrike-thrush and Pied Butcherbird. Several of these birds can be heard in the video clip. A small raptor caused some consternation (for us humans at least), but the Regent Honeyeaters and others settled back into normal feeding behaviour fairly quickly. As with other fast-moving canopy feeders, filming the Regent Honeyeaters was quite a challenge. Given distance from the camera, shade cast by leaves and contrasting brightness of the sky (made worse when clouds rolled in) we were pleasantly surprised upon reviewing the footage; vision of a male bird banded in the Capertee Valley in September 2015 was a special bonus and adds to our knowledge of the movements of the species. It was also good to see birds not yet banded. Most honeyeater species we have filmed have given us at least fleeting moments closer to camera as they glean insects or visit nectar-producers such as banksias, grevilleas, callistemons, hakeas, darwinias and correas. But not the Regents! Indeed, their relative reliance on certain eucalypt blossoms is a major factor in their population decline. Not only has crucial woodland habitat been lost, remaining stands are often fragmented and/or in poor health. Moreover, the Regent Honeyeaters have to compete with larger, more aggressive or simply more numerous honeyeater species (e.g. those better adapted to human-induced changes) when they do find suitable habitat. Like a game of musical chairs, someone loses out when another chair is removed. BirdLife Australia are working hard to prevent the extinction of the Regent Honeyeater by implementing actions identified in the national Recovery Plan for the species. The Regent Honeyeater has become a “flagship species” for threatened and declining woodland birds as any efforts in their conservation benefit other woodland birds in decline, as well as the endangered ecological communities they occur in. Credits: Video production – Darren & Thalia Broughton. Special thanks to Mick Roderick of BirdLife Australia for his knowledge, keen ears and eyes and valuable contribution to the text. The results of the 2106 Census today revealed Greater Sydney continues its push out west as New South Wales (NSW) remains Australia’s most populous state. It has been less than 10 months since the Australian Bureau of Statistics (ABS) took the pulse of the nation to find out who we are, how we live, what we do, and where we’re headed. The Census was used to update NSW’s estimated resident population, which at 31 December, 2016 had grown to 7,797,791 people. The 2016 Census counted 7,480,228 usual residents of NSW on Census night, an 8.1 per cent increase from 2011. The State’s capital also retains its crown as Australia’s largest population centre, with 4,823,991 people now calling Greater Sydney home – an increase of 9.8 per cent. The fastest growing regions in NSW reflect the ever-expanding geographic footprint of Greater Sydney. Bringelly - Green Valley in the city’s south-west experienced the greatest population growth since 2011, with an increase of 23,000 people (28 per cent) to 103,000 people. Approximately 34 kilometres west of Sydney’s CBD, North Blacktown was the next fastest growing region, with its population increasing 18,000 people (24 per cent) to 93,000 people. Outside the hustle and bustle of Greater Sydney, Maitland is the fastest growing region in NSW, with a population growth of 15.5 per cent, followed by Port Macquarie (8.1 per cent) and the Southern Highlands (7.8 per cent). Aboriginal and Torres Strait Islander peoples made up 2.9 per cent of the State’s population, an increase of 43,556 people since 2011. NSW has the highest number of Aboriginal and Torres Strait Islander peoples of all Australian States with 216,176 people, followed by Queensland and Western Australia. The Census once again shows the diversity of NSW, with more than a one in four (27.6 per cent) of the State’s residents born overseas, up from 24.3 per cent in 2011. In the past five years, there has been a dramatic shift in the most commonly reported country of birth by NSW residents. In 2016, China (234,508 people) was the leading country of birth outside Australia, followed by England (226,564 people) and India (143,459 people), a swing from the previously ranked England, China and New Zealand in 2011. Despite this shift, more than two thirds of NSW residents (69 per cent) only speak English at home – down from 73 per cent in 2011. The most common languages other than English spoken in NSW homes were Mandarin, Arabic and Cantonese. Only 4.5 per cent of NSW residents reported that they spoke English not well or not at all. Christianity remains the most commonly reported religion in NSW, accounting for more than half the State’s population – approximately 4.1 million people. However, one in four people (25.1 per cent) reported they had ‘No religion’, up from 17.5 per cent in 2011. The State’s median monthly mortgage repayment actually decreased slightly (0.4 per cent) to $1,986 per month. Over the same period, the median weekly rent for a dwelling in NSW increased by 27 per cent over the past five years to $380 – the joint highest figure in the country. The median weekly personal income in NSW increased from $561 in 2011 to $664 in 2016, an 18 per cent rise. North Sydney was the Local Government Area with the State’s highest median income at $1,386. Australian Statistician David W. Kalisch said Census data is high quality, thanks to the participation of Australians. “The Independent Assurance Panel I established to provide extra assurance and transparency of Census data quality concluded that the 2016 Census data can be used with confidence,” Mr Kalisch said. “The 2016 Census had a response rate of 95.1 per cent and a net undercount of 1.0 per cent. This is a quality result, comparable to both previous Australian Censuses and Censuses in other countries, such as New Zealand, Canada, and the United Kingdom. “Furthermore, 63 per cent of people completed the Census online, embracing the digital-first approach and contributing to faster data processing and data quality improvements. “2016 Census data provides a detailed, accurate and fascinating picture of Australia, which will be used to inform critical policy, planning and service delivery decisions for our communities over the coming years,” he said. You can also attend one of our free Seminars. To find out more about Census Data Seminar series, or to register, go to the ABS website. The results of the latest national Census today reveal we’re a fast changing, ever-expanding, culturally diverse nation. The Census has helped update Australia’s estimated resident population, which has grown to 24.4 million people by December 31, 2016. The 2016 Census counted 23,717,421 people in Australia on Census night, which included 23,401,892 people who usually live in Australia– an 8.8 per cent increase from 2011. On Census night, over 600,000 Australians were travelling overseas. The Census found that New South Wales remains our most populous state, with 7,480,228 people counted, ahead of Victoria in second (5,926,624 people) and Queensland in third (4,703,193 people). Yet it’s the home of the nation’s capital – the Australian Capital Territory (ACT) – that experienced the largest population growth of any state or territory over the past five years, adding more than 40,000 new residents – an increase of 11 per cent. Located approximately 45 kilometres from the Perth CBD in the woody hills of the Darling Scarp, Serpentine - Jarrahdale showed the fastest regional growth in the country, with a population increase of 51 per cent to 27,000 people – up from 18,000 people in 2011. Gungahlin, a thriving northern area in the ACT, continues to flourish and is now home to 71,000 people, up from 47,000 in 2011 – an increase of 50 per cent. Stretching from the beaches of Bondi and Manly to the Blue Mountains, Greater Sydney once again came in as Australia’s largest population centre, with 4,823,991 people, with around 1,656 new people calling the Harbour City home every week since the last Census. However, the cultural hub of Greater Melbourne is closing in fast with 4,485,211 people, increasing by around 1,859 people every week since 2011. 1.3 million new migrants have come to call Australia home since 2011, hailing from some of the 180 countries of birth recorded in the Census, with China (191,000) and India (163,000) being the most common countries of birth of our new arrivals. While the majority of migrants settle in Sydney and Melbourne, most Kiwis choose to call Queensland home, with more than one in three (35 per cent) of the 98,000 New Zealanders who have arrived in Australia since 2011 settling in the Sunshine State. Of all Australian residents, just more than a quarter of people (26 per cent) said they were born overseas, with England remaining the most common country of birth other than Australia. However, with China, India, and the Philippines all in the top five, for the first time in our history, the majority of people born overseas are now from Asia, not Europe. At the same time, we remain a predominantly English speaking country, with 72.7 per cent of people reporting they spoke only English at home. Tasmania had the highest rate of people speaking only English at home with 88 per cent, while the Northern Territory had the lowest rate at 58 per cent. Australia also remains a predominantly religious country, with 60 per cent of people reporting a religious affiliation. However, the proportion of people reporting no religion increased to 30 per cent in 2016 – up from 22 per cent five years ago and nearly double the 16 per cent in 2001. Australians are getting older. The 2016 Census found that there are 664,473 additional people aged 65 and over since 2011. Tasmania is our most experienced state, with nearly one in five people aged 65 and over. The Apple Isle also recorded Australia’s highest median age (42 years), ahead of South Australia (40 years). The proportion of the people who reported as having Aboriginal and/or Torres Strait Islander origin has increased again in 2016, accounting for 2.8 per cent of the population. With 649,171 people indicating that they have Aboriginal or Torres Strait Islander origin, the population size has increased by 18.4 per cent since 2011, and nearly doubled since 1996. Australian Statistician David W. Kalisch said the ABS was pleased to deliver this valuable dataset for Australia, emphasising it is high quality and acknowledging the participation of Australians. “2016 Census data provides a detailed, accurate and fascinating picture of Australia and our communities,” Mr Kalisch said. The Independent Assurance Panel, established by the Australian Statistician to provide extra assurance and transparency of Census data quality, concluded that the 2016 Census data can be used with confidence. “The 2016 Census had a response rate of 95.1 per cent and a net undercount of 1.0 per cent, meaning the quality is comparable to both previous Australian Censuses and Censuses in other countries, such as New Zealand, Canada, and the United Kingdom,” Mr Kalisch said. “Sixty-three per cent of people completed the Census online, embracing the digital-first approach and contributing to faster data processing and data quality improvements. The Turnbull Government welcomes the appointment of Ms Christine Holgate as the new Managing Director and Group Chief Executive Officer (CEO) of Australia Post. Ms Holgate is a highly experienced chief executive, board director and business leader, with a strong record of managing and leading large and complex organisations. She has been CEO of Blackmores, a world leading Australian manufacturer and distributor of health products, since 2008. Ms Holgate also has extensive experience working closely with governments in regulated sectors including finance, telecommunications, media and healthcare. In 2015, she was named CEO of the Year by the CEO Institute. Ms Holgate will commence in the role in October 2017. Ms Christine Corbett, currently the Group Chief Customer Officer of Australia Post, will act as interim Managing Director from the departure of Mr Ahmed Fahour AO on 28 July 2017 until Ms Holgate takes up her new position. Following direction by Government in February 2017, the remuneration of the Managing Director and Group CEO is now subject to oversight by the Remuneration Tribunal, an independent statutory authority. Consistent with the parameters set by the Remuneration Tribunal, the Australia Post board has agreed to a total remuneration of $1.375 million and performance pay of up to $1.375 million per annum. The Ministers congratulate Ms Holgate and Ms Corbett on their appointments, and wish them well for steering Australia Post through a critical period for the business. The Ministers also thank Mr Fahour, who steps down as Managing Director and Group CEO on 28 July 2017, for his leadership and oversight in guiding Australia Post since 2010. CSIRO’s Energy Centre houses our world-class testing facilities that are being used to help develop clean and affordable energy. The centre is also home to 300 kilowatts of solar photovoltaics, one megawatt hour of battery storage and five kilowatts of wind generation. For more information on CSIRO’s state-of-the-art facilities in energy efficiency visit: csiro.au/en/Research/EF/Areas/Facilities. For more technical detail, visit the interactive self-navigation tour:csiro.au/energy/360tours. The Australia Council for the Arts has today released the findings from the third National Arts Participation Survey. The findings confirm the significant and increasing personal value Australians place on the impact of the arts, and the ways in which they make our communities stronger and more cohesive. Chief Executive Tony Grybowski said that this research shows more clearly than ever what an essential role the arts play in daily life, and in building social cohesion which promotes a healthy and inclusive public life for all Australians. “The research demonstrates that the arts have a unique capacity to connect Australians from diverse backgrounds, and that two in three of us believe the arts help us to understand other people and cultures, and allow us to connect to others. We are highly connected digitally and yet we live in a global era of growing social, cultural and political division that is being evidenced through major social threats. These findings confirm that Australians firmly believe the arts contribute to addressing these issues through breaking down barriers, promoting inclusion and creating understanding.” Mr Grybowski said. “It is also overwhelmingly apparent from the data that while 98% of Australians engage in the arts, they do so more frequently and with much greater breadth than they realise. We need to demystify what we mean by ‘the arts’. Many Australians have a narrow view of what the arts include, often dismissing the things we enjoy most frequently, such as listening to music, reading or going to a festival. As a result, they are underestimating the vital role the arts play in the quality of their everyday experience. Gaining this clarity is important so that when talking about the value of supporting the arts we all understand what is at stake. “As the third survey in the series, the research identifies important trends. Engagement with First Nations arts has doubled since 2009, reaching 7 million Australians last year. Creating, accessing and sharing the arts online is booming - new and additional arts experiences are expanding on rather than replacing live attendance which remains strong. “The report also reveals the importance of the arts in the lives of younger Australians. They create and experience the arts at the highest rates, especially online; they love festivals and over half engage with the arts as part of their cultural background. This gives the arts a unique role in shaping the future of our national culture. “The research is responsive to changes in the way we create and experience art. For the first time in 2016 the survey collected data on Australians’ engagement with the arts as part of their cultural background, community arts and cultural development, and festival attendance. This highlighted the importance and accessibility of festivals, with 9 million Australians attending an arts festival in 2016. Community Arts and Cultural Development is acknowledged as a highly innovative area which crosses art forms, connects artists and audiences, and delivers both high quality art and transformative social outcomes. “The 2016 National Arts Participation Survey builds on decades of work by the Australia Council to demonstrate the essential value of the arts to individual and public life, and we consider this central to our mission. The evidence demonstrates the impact of the arts across nearly every facet of society, making it a valuable resource to inform policy, programs and investment well beyond the arts sector. 98% of Australians engage with the arts and since the 2013 survey there is substantially increased recognition of their positive impact on our wellbeing and ability to develop new ideas. More Australians now believe the arts reflect Australia’s cultural diversity and that they shape and express Australian identity. 3 in 4 Australians believe the arts are an important way to get a different perspective on a topic or issue. 7 million Australians experienced First Nations arts last year, double the number since the first survey in 2009. 4 in 5 believe they are an important part of Australia’s culture. Three quarters of us think the arts are an important part of the education of every Australian and are proud when Australian artists do well overseas. Younger Australians (15-24 years) create and experience the arts at the highest rates, especially online; they are big festival and First Nations arts attenders; and over half engage with the arts as part of their cultural background. Online and live arts experiences both remain important to Australians, creating greater access and new experiences rather than one replacing the other. 8 in 10 people engage with the arts online, increasing from 7 in 10 in 2013, and 5 in 10 in 2009 - with music streaming the largest contributor to this growth. Online activity is creating new opportunities to collaborate and share, and connecting artists and audiences directly. 9 million Australians attended an arts festival in 2016. Arts festivals are diverse and accessible, bringing local communities together in immersive experiences and encouraging regional and international tourism. This survey saw a substantial increase in the number of Australians attending theatre or dance from 2013 (42% to 53%), as well as increases for visual arts and craft, and new data which shows 1 in 5 Australians attend literary events such as book clubs, talks and festivals. The downward trend in the proportion of Australians who donate money generally is not reflected in arts giving. 1 in 4 Australians give time or money to the arts reflecting their value in our lives. For more information and to explore interactive dashboards visit theAustralia Council website. The Australia Council for the Arts is the Australian Government’s principal arts funding and advisory body. The Australia Council is committed to making the vitality of our arts and culture more visible, and to recognising and supporting the evolving way that Australians make and experience art. About 10,000 women will be offered free, life-saving mammograms every year at a new $957,000 BreastScreen NSW centre at Erina on the Central Coast. Minister for Health and Medical Research Brad Hazzard today joined Member for Terrigal Adam Crouch and Taylor Martin MLC to officially open the new state-of-the- art facility, which will boost breast screening capacity by 20 per cent on the Central Coast. “I particularly encourage women on the Central Coast aged over 50 to take 20 minutes every two years to visit this great new centre – the screening is free, you don’t need a doctor’s referral and it is potentially life-saving,” Mr Hazzard said. Mr Crouch said the cutting-edge facility will enable 1,500 more local women in the next year alone to be screened. “The centre is also working with local community networks to increase the number of Aboriginal women who attend for a regular breast screen,” Mr Crouch said. The centre features an additional $450,000 of equipment, including a digital mammography unit, and an imaging unit that will provide instant, high-quality specimen images during biopsy procedures. The centre offers free mammograms to women over 40. Women in the 50-74 age group are encouraged to have a breast screen every two years. The centre, previously based at Gosford Hospital, also has free, accessible parking and extended opening hours. BreastScreen NSW Northern Sydney Central Coast Director Meredith Kay said the centre would provide an enhanced service in the rapidly growing region. A topping out ceremony for the $348 million Gosford Hospital redevelopment today marked the fast-tracked, 11-storey clinical services building reaching its highest point. Minister for Health Brad Hazzard joined Parliamentary Secretary for the Hunter and Central Coast Scot MacDonald, Member for Terrigal Adam Crouch and Taylor Martin, MLC, as a Norfolk Pine was raised to the new rooftop helipad of the 11- storey hospital. “We have delivered on our promise to fast-track the revamp of Gosford Hospital. This is a top-notch facility that will serve the people of the Central Coast well into the future,” Mr Hazzard said. expanded maternity, cancer and cardiovascular services. Mr MacDonald said the NSW Government has partnered with Lendlease and the Darkinjung Local Aboriginal Land Council to provide local jobs, including 30 apprenticeships, 11 of which are local Indigenous apprentices. “This project is a boost for locals with up to 20 per cent of the contractors and subcontractors of Aboriginal or Torres Strait Islander descent,” Mr MacDonald said. Local MP Adam Crouch said with strong population growth forecast, he was very pleased that Gosford Hospital will well and truly meet future patient demand. NSW emergency departments failed to meet length-of-stay targets during the winter flu seasons of 2010-14, with more patients waiting longer to be seen and increased numbers giving up on treatment, a study has found. The study of 11 million presentations to 115 NSW hospitals during the five-year period looked at the relationship between weekly flu activity and the number of people who stayed longer than four hours (a national benchmark) at a hospital emergency department. It also looked at the number of people who left the hospital before starting or completing their treatment. UNSW School of Public Health and Community Medicine’s Dr David Muscatello will present the findings at the Communicable Diseases Control Conference in Melbourne today. He says the peak flu period is associated with annual peaks in patients exceeding the length of stay target and more patient walk-outs. “More patients in the emergency department with influenza means more being admitted to hospital for further treatment,” he says. In 2012, around 17,000 more patients a year in NSW stayed in the emergency department longer than the target time of up to 4 hours. Around 13,000 more patients gave up waiting for treatment, Dr Muscatello says. Influenza in the community is closely monitored by health departments. Hospital managers could use that information to anticipate a greater demand and adjust staffing levels. Meanwhile, individuals can assist hospitals to cope during flu season by ensuring they get the flu shot. “This study didn’t look at vaccination, but vaccination is the best way to prevent influenza and would be the best available way to reduce the impact on hospitals,” Dr Muscatello says. “Risk groups are important and get the vaccine for free from their GP. The 2012 flu season was the worst for NSW hospitals in the years studied, while the 2010 flu season was a low activity year, following the 2009 “swine flu” pandemic. The research, 'Influenza-associated delays in patient throughput and premature patient departure in emergency departments in New South Wales, Australia: A time series analysis', published inEmergency Medicine Australasia was co-authored by Associate Professor Michael Dinh and Dr Kendall Bein of Royal Prince Alfred Hospital and the University of Sydney. 'The actual number of treatment episodes for amphetamines rose from around 16,900 in 2011–12 to 46,400 in 2015–16—a 175% increase,' Mr James said. 'Across most states and territories, alcohol was also the most common drug for which people sought treatment, but in South Australia and Western Australia, it was amphetamines, and in Queensland, it was cannabis,' Mr James said. 'Most clients completed their treatment in just under 3 weeks, though this varied depending on the type of drug—from 13 days for cannabis to 39 days for heroin,' Mr James said. 'The reverse was seen for clients aged 40 and over, with the proportion rising from around a quarter (27%) to about one-third (32%) over the same period,' Mr James said.